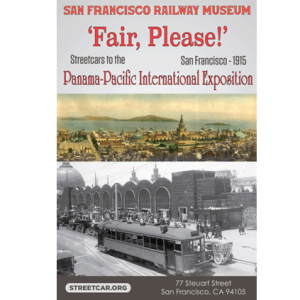 On February 21, 2015, a day-long community event will honor the 100th anniversary of the opening of the Panama-Pacific International Exposition and will kick-off a year of Centennial events. 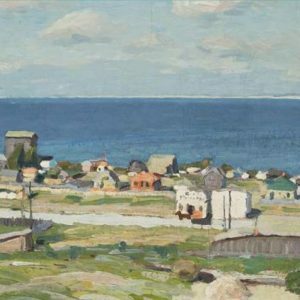 A variety of educational activities for families and adults are planned, along with viewing of exhibitions and entertainment. The PPIE introduced the Ukulele to the United States, causing it to become the rage of its day. Lead by a Ukulele Band of local players, the community will be invited to bring their Ukes and play along. Noon: Opening Ceremony under the Rotunda of the Palace of Fine Arts attended by civic dignitaries and c.1915 Fair attendees Buffalo Bill Cody, Laura Ingalls Wilder, Henry Ford, Charlie Chaplin, Michael H de Young, aviator Art Smith and more. 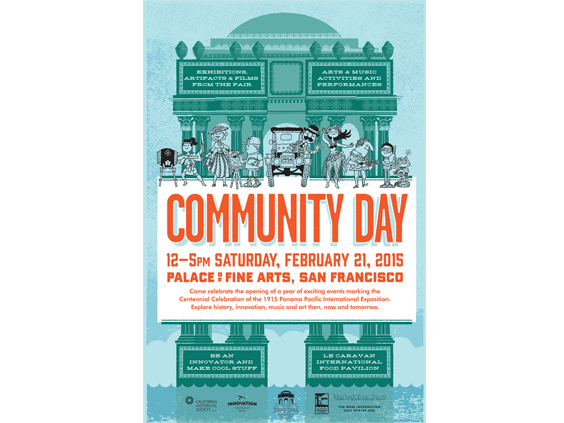 Noon – 5:00 PM: Musical Performances by talented community organizations including The Academy of Hawaiian Arts, Emeryville Taiko, Nemenzo Polynesian Dance Company, Jessica Recinos Featuring SolTrón, Mala Junta, and the San Francisco Opera Merola Opera Program. 3:00 PM: Uke- A-Thon under the Rotunda – featuring Ben Ahn, Hana Hou 100, Hiram Kaailau Bell,and other special guests. All are welcome. Lessons, dancing, fun! Noon – 5:00 PM: Exhibitions, activities, music, performances, displays in the Palace of Fine Arts, enlivened and occupied throughout the year by the Innovation Hangar. A broad array Bay Area cultural organizations, including the Fine Arts Museums of San Francisco, Music in Schools Today, and The Exploratorium, Heyday Books, and companies with connections to the original fair (AT&T, Wells Fargo, Hearst Corporation and Ford Motor Company) will come together that day as the California Historical Society opens its 10,000 square foot exhibition on the PPIE history and is joined by the Bay Area Discovery Museum, Kaboom, Smithsonian, Maker Faire, Tech Museum, and Wearable World Technologies. See an original 1915 Ford Model T and sit in a Wells Fargo Stagecoach! Guardians of the City will also feature three of the ten original fire engines actually from the Exposition. Visit the Partner Pavilion featuring booths from Cameron + Company, Chinese Historical Society of America, Friends of the Exposition Organ, Historypin, Mechanics’ Institute, Oakland Museum of California, Presidio Trust, San Francisco History Association, San Francisco Lesbian/Gay Freedom Band and Lesbian/Gay Chorus of San Francisco, San Francisco Railway Museum and Gift Shop, Shaping San Francisco, Society of California Pioneers, Swanton Pacific Railroad Society, The Victorian Alliance of San Francisco, Western Neighborhoods Project, and World Arts West. 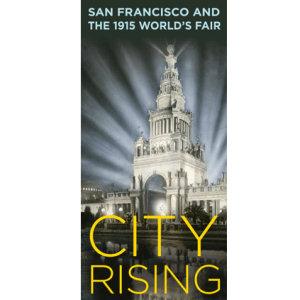 View rare collections of PPIE artifacts and meet author Laura Ackley who will sign copies of her book San Francisco’s Jewel City. 7:00 – 10:00 PM: Palace After Dark. Stroll the Palace grounds– experience what it was like to be at the Exposition and enjoy a film and light installation by Optic Flare in the Palace of Fine Arts Theater lobby. Refreshments from local purveyors will be available for purchase. Made possible by a grant from Taube Philanthropies with additional funding from The Friend Family. Transportation: The Palace of Fine Arts is well served by MUNI, Golden Gate Transit, and PresidiGo Shuttle. Additional Parking information can be found at the Presidio Trust. PPIE100 Opening Weekend is made possible by the Hearst Corporation.